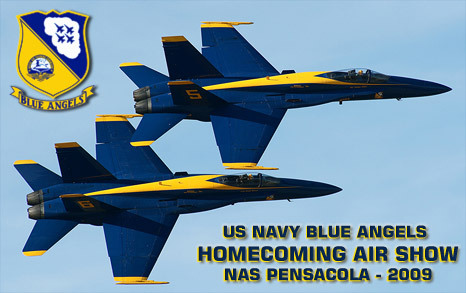 Every year the USN Blue Angels end their airshow season with a homecoming show at NAS Pensacola, FL. Ramon van Opdorp visited the show on November 13-14, 2009. Already planned for months, was a visit to the home of my personal favorite display team: Pensacola in Florida, home of the United States Navy Blue Angels demonstration team. Each year the Blue Angels organize a “homecoming” show, which marks the end of their air show season. A short list of participants is announced at the end of each year, with the Blue Angels as the main attraction. If you like prefer lots of action rather than boring formation flights, the smell of kerosene, and sight of large afterburners, then the Blue Angels Homecoming show is the place to be. This year’s show presented a key event for the Blue Angels, as the support aircraft C-130T “Fat Albert” performed her final JATO take-off, which made me even more motivated to visit Pensacola this year. Naval Air Station Pensacola, also known as “the Cradle of Naval Aviation”, is the primary training base for all Navy, Marine and Coast Guard aviators and Naval Flight Officers. Of course it is also the home base for the United States Navy Flight Demonstration Squadron, the Blue Angels. The station has a rich history, which dates back to World War I, and some parts of the harbor even date back to the Civil War. To provide this training, a large fleet of different types of aircraft is in use at Pensacola. The T-6A Texan II, T-45C Goshawk, T-39 Sabreliner are used for navy training, while the USCG has several T-1A Jayhawks stationed here. Besides the flying aircraft also a fair amount of instructional airframes are found here. As with every big trip everything was planned and arranged months in advance, unfortunately there is always the prime unpredictable factor: the weather. Florida’s weather is known for its hurricanes and this time I was also treated with one, named Ida. Luckily for me, and of course all residents of this area, the Hurricane solved into a tropical storm. I left Houston for the one hour flight to Pensacola, which was the last flight to Pensacola, before they shut-down the airfield. With Ida clearly visible on the horizon, and some heavy turbulence, we made it to Pensacola Regional Airport. Normally two or three days are planned to set-up the Homecoming air show, this was reduced to one and a half due to hurricane Ida. The positive side of such a hurricane is that it leaves completely clear skies behind her perfect for photography. With the sun almost all day behind you, photographing on the show days was even more enjoyable. Before the Blue Angels perform their display with the six F-18C Hornets, the C-130T “Fat Albert” starts the show with the JATO take-off, followed by a 5 minute display. The JATO take-off by the massive C-130T is probably the only memorable Hercules take-off, or at least the most well-known take-off display. On November 13, the last daytime JATO take-off was performed, followed on November 14 with the last night JATO take-off by Fat Albert. The official statement by the U.S. Navy said: ”a dwindling supply of rocket bottles — and a budget that doesn’t allow for replacements — has forced the team to limit its JATO demonstrations to about 20 a year." The JATO era has now come to an end, with the Blue Angels re-assuring statement that they are searching for an alternative “impressive” part in the Fat Albert display. Replacing the JATO take-off will be a hard struggle, as it awed and amazed thousands of people around the world how this massive beast got airborne with these rockets. In my humble opinion the list of participants for the homecoming show was far from being impressive. In the fast jet section, only a F-16 Fighting Falcon of the West Coast Display team was soaring the skies on both show days. The F/A-18E Super Hornet performed only during the Saturday show. A real American treat that basically could be put in the Jet section, was an impressive ground display of the “Shock Wave Jet Truck”. A real shock is produced when you equip a “normal” American truck with three Pratt & Whitney J34-48 jet engines, blasting over the runway doing about 400 km/hr. In the slow mover section a lot of diversity was available. A first for me were the Geico Skytypers. As the name already explains this formation of six T-6 Harvard is typing advertisements and even the American flag in the air. Another nice display was flown by the Aerostars, which consists of three YAK-52TW with their roaring 9-cylinder radial engines. Sadly cancelled weeks before the show was the display of Dale Snodgrass flying the P-51 Mustang, which would have been a great display. Of course the main attraction at this show were the USN Blue Angels. As always an awesome and very aggressive display was flown by the six F-18 Hornet aircraft: The aggressive double take-off by the two solo aircraft, close formation flying at centimeters from each other, and the six aircraft crossing at the middle of the field while the two solo aircraft are coming by from all wind directions. I have seen my share of aviation museums around the world. One museum had been on my “wish list” for years: the National Naval Aviation Museum, one of the largest aviation museum in the world. The museum has an excellent collection of only naval aircraft, with on dedicated days the possibility to watch the Blue Angels practice behind the museum. There are too many highlights to list them all, as each aircraft in there has a great history or story to tell. However to note some, the F-14 Tomcat at the entrance is a great eye catcher, as are the four former Blue Angels A-4 Skyhawks hanging from the ceiling inside the museum. In the Pearl Harbor area, a large amount of aircraft from this era are presented such as the SB2A Buccaneer, SBD Dauntless, SB2U Vindicator, F-6F Hellcat, F4F Wildcat, and A6M Zero to name a few. The most impressive aircraft for me is a original N1K2-Ja Shiden Kai, codenamed “George”. Only three aircraft survived the war to be restored. This example was retrieved from one of the Japanese Islands, and put on an aircraft carrier to be ferried to the USA. Of course the naval jet era is also represented in the shape of many different aircraft, like a original US Navy F-4 Phantom that shot down a Mig-19 over Vietnam. Also the F3H Demon, D-558-1 Skystreak, FJ-4 Fury and RA-5C Vigilante are absolutely worth mentioning. Inside the museum there is also the Cubi Bar Café, decorated with over one thousand squadron and unit plaques reassembled from the historic Officers' Club at Cubi Point in the Philippines, tracking almost forty years of deployments to the Western Pacific by a variety of squadrons and carriers. With great weather, a large amount of very rare and excellent restored aircraft inside the museum, and three days in a row watching the Blue Angels there is no need for further explanation on how this trip was. I will definitely visit the homecoming show again in one of the coming years, and make another one day pit-stop at the National Naval Aviation Museum.